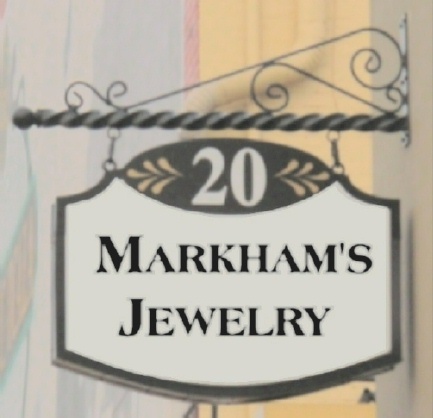 This double-faced, carved, High Density Urethane sign gives the name and street number of a jewelry store. This all-weather sign is hung from a Delixe Heavy Duty Large Scroll Bracket(M4030) over a sidewalk. The sign features the 2.5-D carved (raised, flat) street number, gold-painted art flourishes and sign border. The text itself is carved. After painting with bright long-lasting automotive-type enamels, this plaque is clear-coated twice, providing it with UV protection and durability for outdoor use.